More than 40 years can do quite a bit to a person. "Over the hill" is what they call it: that point in your life when the world changes direction and the annual ability to reinvent yourself or try new things begins to fade. Fighting the facts of life is like swimming against the current; you feel like progress is being made, but really powers are working to keep you moving backwards. 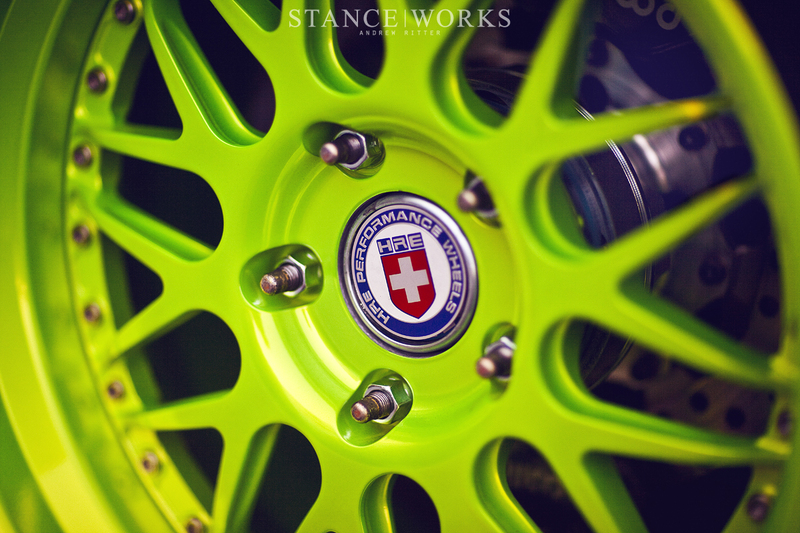 It's something that's not exclusive to people either; similar things happen to our beloved cars' lineage. The luster fades, the hairs turn grey. What was once a sports coupe is now a family sedan, or what was once a muscle car is little more than an econobox. Model names grow stale: where "Charger" was once synonymous with sheer power and raw strength, it has been reduced to the likes of "Grandma's car." However, there are a few namesakes that seem to thumb their noses at the current of time and reinvent themselves at will. The Ford Mustang is a jetski in the river. 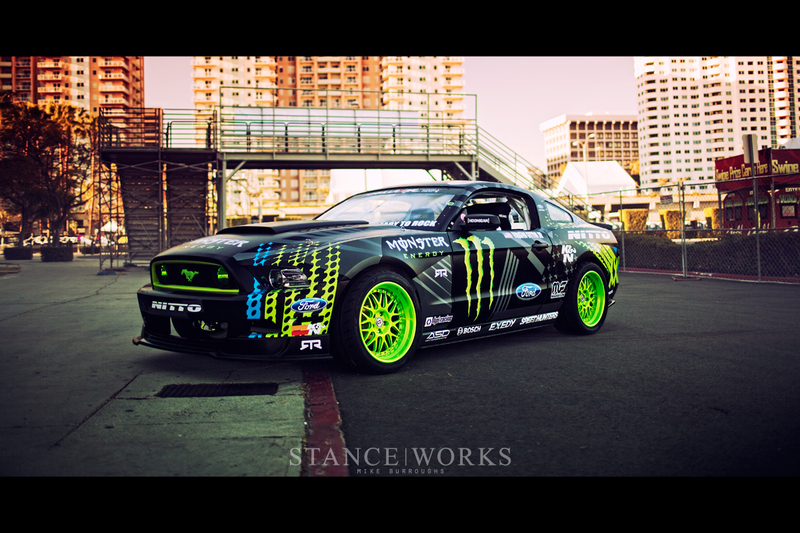 Here, in 2013, the Ford Mustang finds itself in a bright green and satin black Vaughn Gittin Jr.-designed Monster Energy Drink livery - all new thanks to a revamp of the Gittin drift team and a change of his title tire sponsor. Nitto Tire has come on board to replace Falken Tire, who, for many, has been synonymous with Gittin's past cars for years. However, the new partnership and the NT05s have been yielding great results - Gittin sits in the #1 spot with an 11 point lead so far this season. And of course, the successful stallion finds itself in a drift series that is iconically not American. 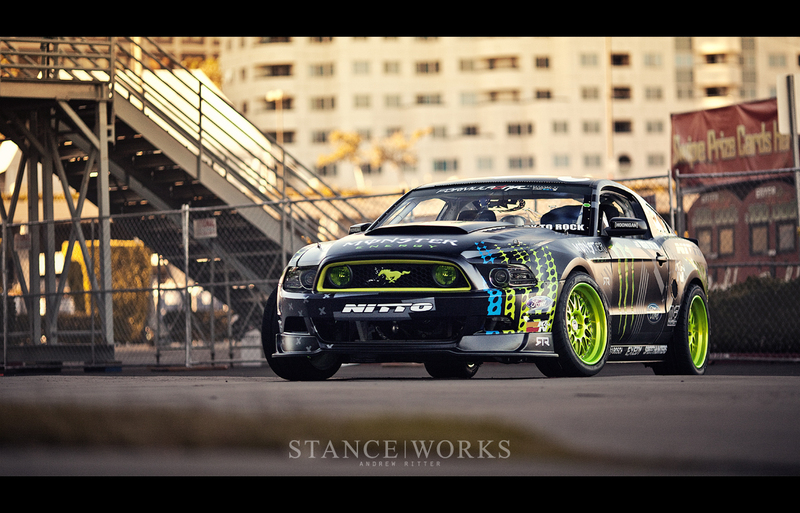 Gittin's Mustang stands as a testament to the pony's staying power. While American muscle has gone in and out of style for decades, the timeless coupe refuses to bow in a sport that is predominantly run with Japanese makes. 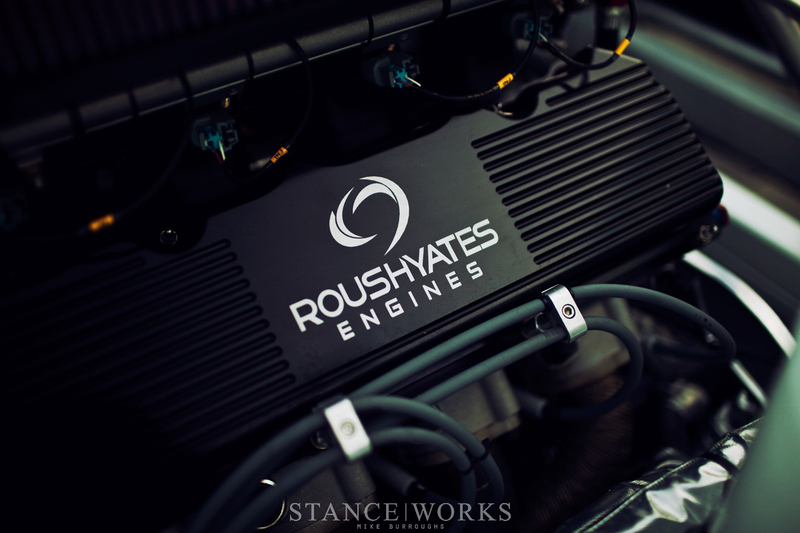 Instead the group at Autosport Dynamics Inc. (ASD) and RTR have done the exact opposite, making Detroit iron chomp at the bit like a thoroughbred ready to run. Vaughn's Formula Drift Mustang race car proves that the Mustang doesn't have a "hill": the ageless car stuns us all again showing its incredible range and timeless beauty as it roasts Nitto rubber all across America in Formula Drift. Everyone has had an experience with a Mustang at some point in their life. The stories are probably as numerous as the examples of the car on US streets. An uncle who owned one, or a brother that took his to the drag strip on Sundays... it could be as simple as seeing the same one every day on your morning commute. Something about the American classic seems to draw us in, or at least make us think. My mustang story is simple: Dad owned one. A '65 Caspian Blue straight six. I was 13 or so, and every other weekend was spent putting a soapy sponge all over that car. I would ask Pops if I could clean the car, as if he'd say no, and without fail I would wash and dry the glimmering, nostalgic piece of Detroit steel. I wiped down the chrome galloping horse on the grill, making sure the inside of those '65-only door vents were neat and tidy. That mustang is the beginning of my love affair with cars - the blue metallic paint sparkled in the Arizona sun, and to have my dad drive me around in her to Sunday car shows made washing the car all the more worth while. Mr Gittin's car is a far cry from the stock cruiser of my childhood, but I can't help but see the green emblem nestled between the headlights and think back to that time in my life. 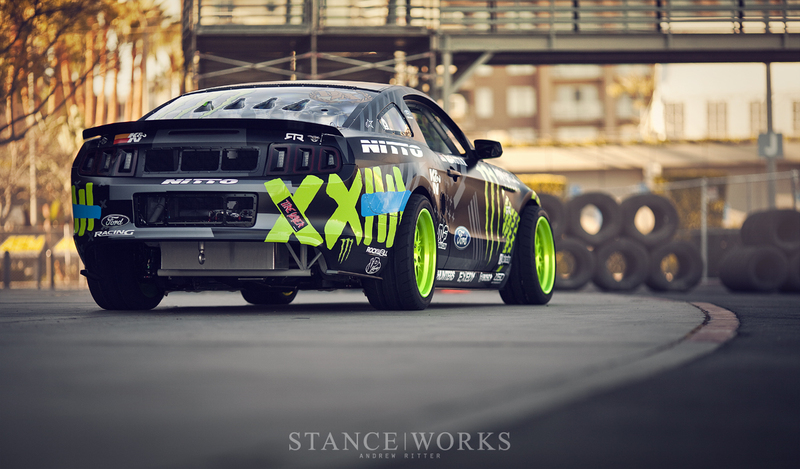 Seeing this purpose built drift car adds yet another Mustang story to my library. For that reason, the Mustang is a cult car for many fans, Vaughn included. 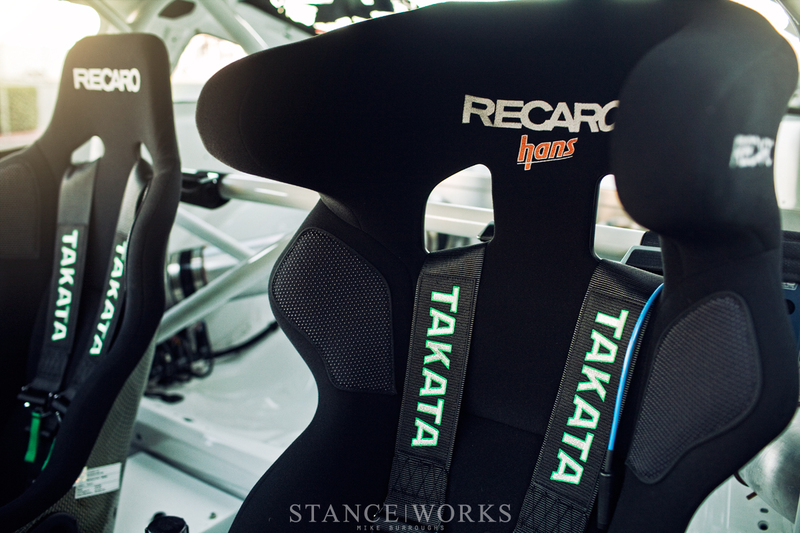 His stable includes an array of ponies, most having been massaged by his tuning company, RTR. A big dream of Vaughn's was to partner with Ford to bring specially styled and modified Mustangs to the Ford showroom. 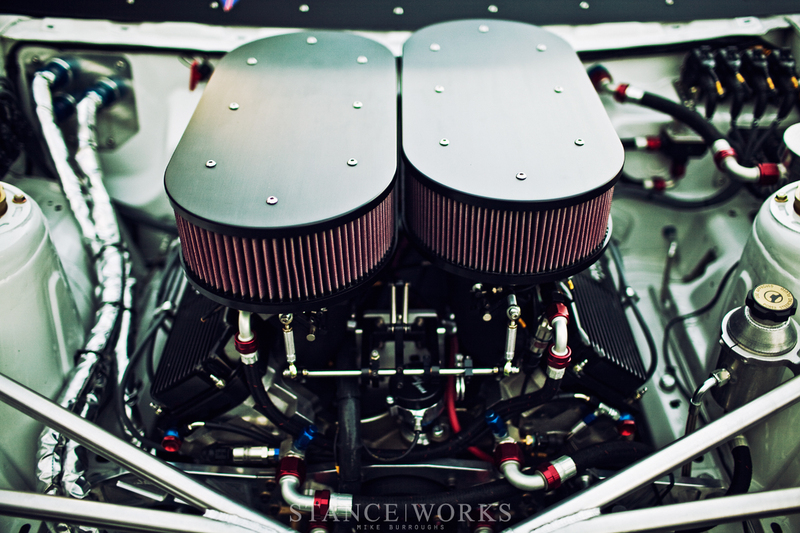 "Overall I just wanted to bring something fresh into the Mustang world, something that would appeal to our generation as well as traditional Mustang enthusiasts, and have user-adjustable performance to suit his or her needs on and off the track..." A love of the model coupled with the technical savvy to improve upon the base has resulted in RTR-tuned Mustangs for all walks of life, available with an array of options to suit the casual driver to the diehard enthusiast. Mr. Gittin has a long standing and growing collaboration with Ford - with a 2007 Formula Drift world championship and a 2010 FD championship under his belt behind the wheel of Mustangs, coupled with a near double-digit collection of Ford products, it's plain to see his support for the mark runs very deep. 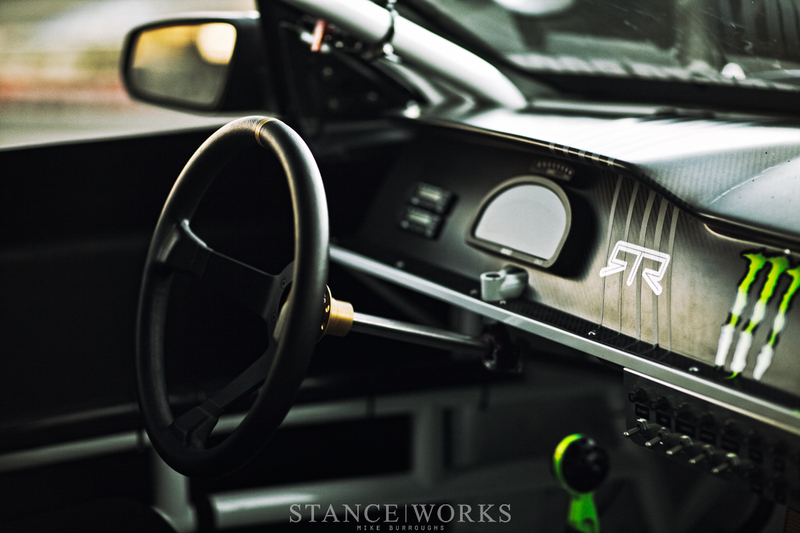 Vaughn truly prides himself on delivering everything he can on the track as well as with RTR. 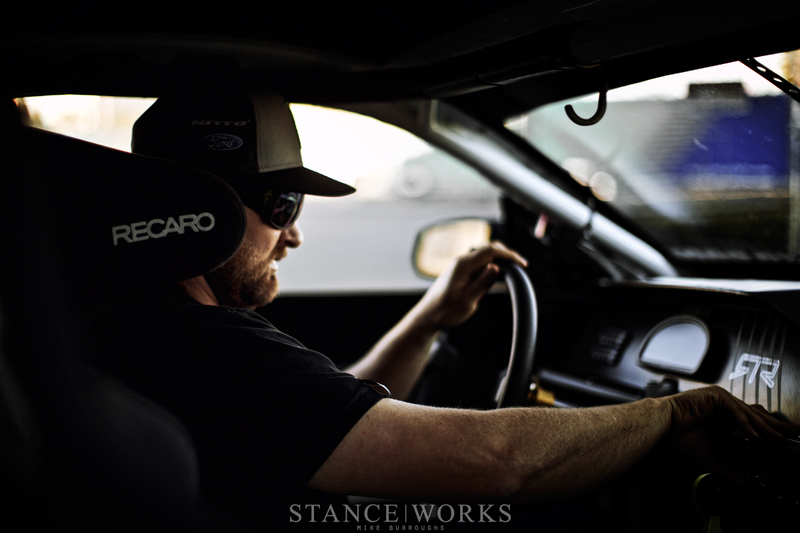 "Between the RTR, Drift team, and the Performance Autosport Mustang RTR road race team, we make sure our end users end up with one of the most balanced, adjustable, reliable and fun to drive cars on the street today." Passionate people make passionate products. 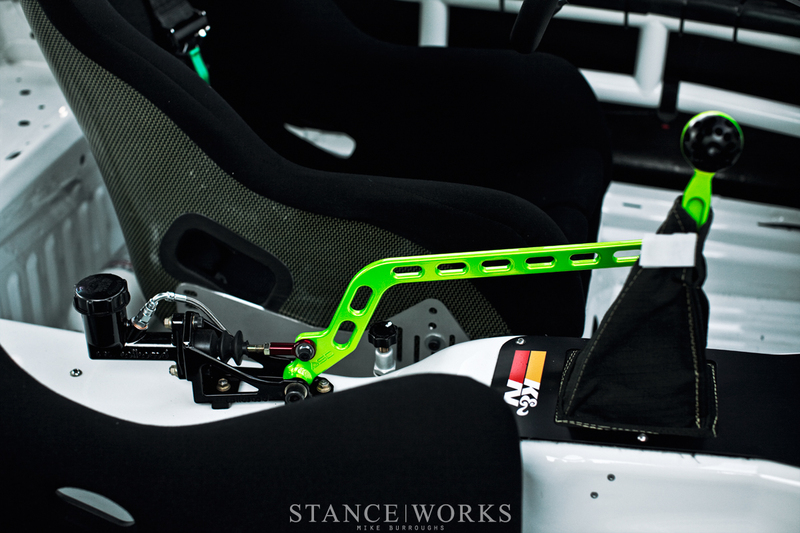 We at Stance|Works recognize that the final item is a direct reflection of the attention to detail. Vaughn's precision attitude on the track has found a home in the fabricators workshop as well. We pressed Mr. Gittin for details on this latest iteration of the sliding stallion. Beneath the loud Monster livery which Vaughn dubs his "Dazzle Camo," inspired by old battle ships, and behind the HRE / Nitto wheel and tire package is a 2014 Mustang Body which began as, by comparison, a less exciting white. When asked what it's been like piloting a Ford pony car through the Formula D field for 6 years, Vaughn is quick to explain. "... the entire company is incredibly passionate and all about being innovative and having fun. I have been there through thick and thin and I am really pumped to be working with them in many different ways to support Ford as a whole." This base, both sponsor and chassis, make Vaughn and his team of friends and family a real force to be reckoned with as the drift season progresses. Finding a home with such a supportive platform and group of individuals behind you moving towards a single goal must feel incredibly stabilizing when behind the wheel, hitting clipping points and scraping retaining walls. 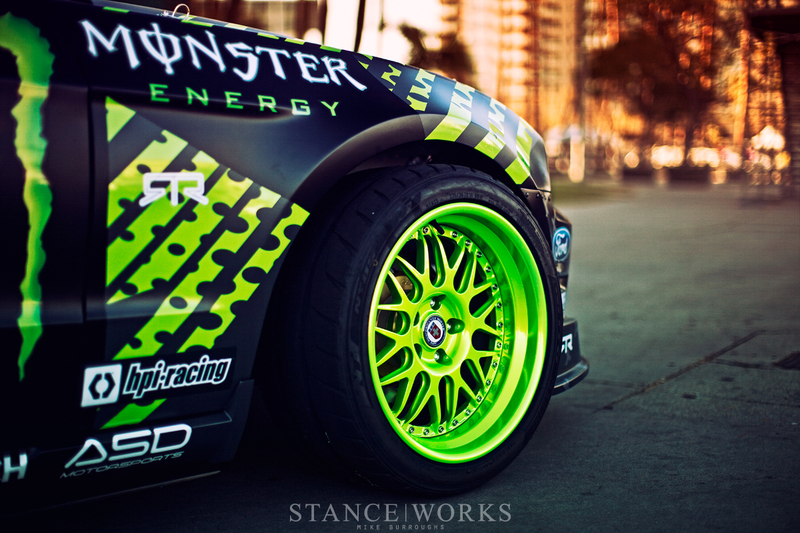 To add to the impressive force that is Gittin, Ford, and ASD is Nitto Racing. As mentioned prior, Nitto Racing is excited to welcome Vaughn to their 2013 team. In 2012, Gittin was just a single position away from taking the championship, finishing second overall; however, Vaughn and Nitto are after the top spot and are off to an amazing start. With an overall points lead just two rounds into the season, things are phenomenal already. 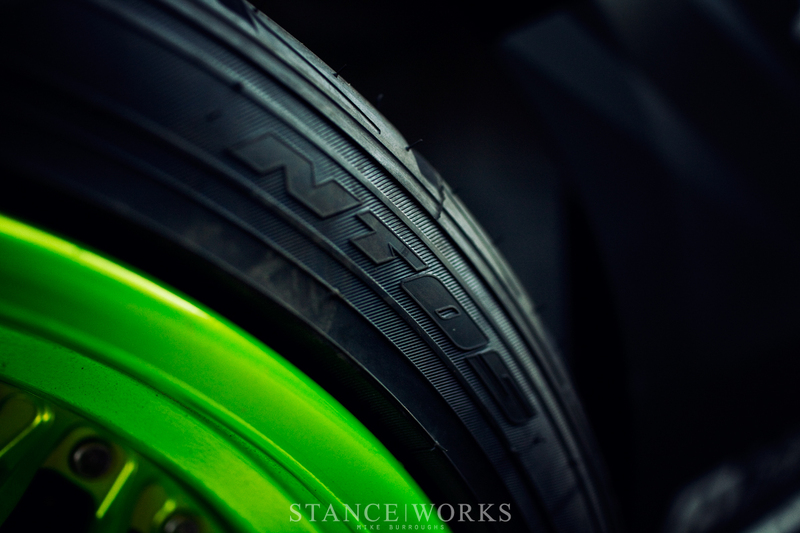 Nitto is providing its NT05, a max-performance radial built specifically to deliver consistent grip through a full range of temperatures, and to handle extensive abuse - a match made in heaven with Gittin's drift car. Getting those clipping points and trimming thousandths of an inch off those retaining walls is made possible by a group of talented individuals at ASD. 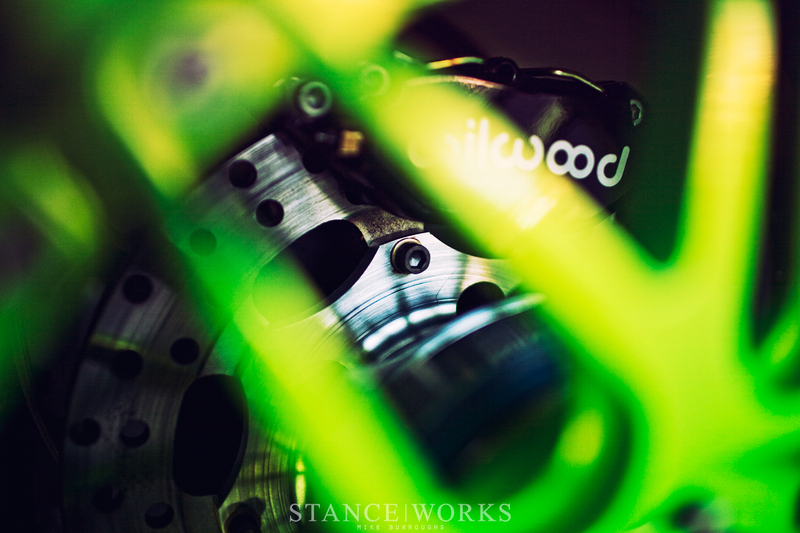 ASD has been with Gittin through his 2007 World Championship, 2010 Formula Drift Championship, and 2011 WDS Championship wins. Responsibility for taking the, quite literally, blank canvas white 2014 Mustang and forming it into the widened, caged and Roush/ Ford Racing powered beast lays solely on the shoulders of ASD's talented engineers and fabricators. I left out the part about suspension because, well, as Vaughn puts it "We don't talk about suspension ;)". Every teams has their secrets. These secrets are indeed what keep the drift mustang pointed in the perfect direction when Vaughn unleashes the 845 unbridled horses that await from under his right foot. Power has been something that Mustangs have never had in short supply, assuming the purchaser checked all the right options. My father's 65' was missing a couple cylinders to be considered a real hot rod, but nonetheless, the car propelled me into the world of mechanics. This further moved into engineering and car modification. Vaughn seems to have taken a liking to the pony car just like I have, and has devoted himself to the model. His personal 1969 RTR-X project that has received such positive accolades is the Mr Hyde to the Dr. Jeckel that I remember wiping the dirt off of all those years ago. The latest drift RTR takes some significant styling cues from this intense build of Vaughn's, giving more credit behind the styling based on his direction. "I worked with Caleb at Weapon Collective whom I work on a lot of other projects with to design something that represented me. Obviously my Mustang is my weapon of choice to bring to the line for battle and the insanity and infinite possibilities to get crazy were a perfect fit for the overall goal. The livery is a result of about three months of back and forth to end up with something I am very proud of our result and the response has been awesome!" The design of the new car is in-your-face and all business. The front HREs sitting very proud of the fenders with the NT05's tread displayed for the entire world to see, screaming "function over form." Couple that with the muscular hood, pinned atop the built powerplant and this horse is ready to run before the fuel pump is even flipped on. 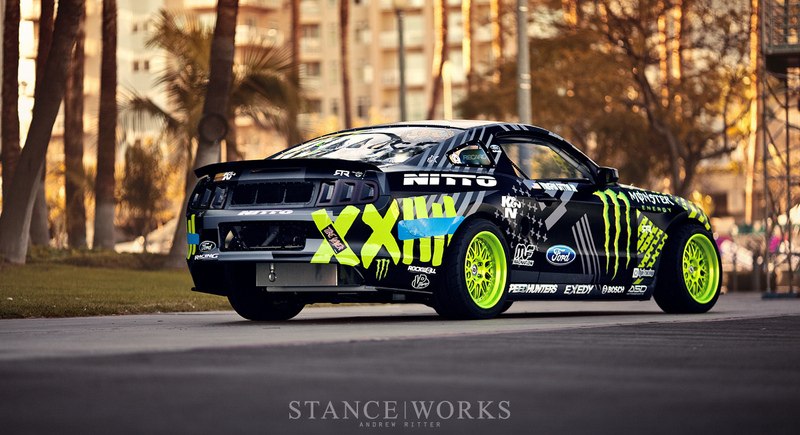 In a field of bright, attention grabbing cars, the Monster/Nitto/Ford Drift Mustang stands out. The one-two punch of a unique chassis coupled with Vaughn's impressive styling cues makes sure that this Ford Mustang does not go unnoticed. For me, this car has a Grave Digger-esque appeal in a similar way to the famous monster truck. No single aspect really stands out on its own: istead, each piece, from the wheels to the roof line, creates a crescendo. True to form, the new Vaughn Gittin Jr. drift car has that very Mustang appeal. Everything speaks in unison. From drift destroyer, to classy cruiser, the Ford Mustang continues to run the spectrum of US cultural icon. Whether the chassis is being pitched sideways with near 850 stallions tossing hot rubber on retaining walls, or freshly washed by your son who can't want to click into the lap belt of the passenger seat and be driven to the latest classic car meet of the local diner, the Mustang will always be there. That car that refuses to grow old, but instead finds new youth with a fresh drift culture. Vaughn Gittin Jr., Nitto, RTR and the ASD crew will respectively continue to push the boundaries of what the two door pony car is capable of. We thank them for that, because sometimes you have got to let go of the reins and let the horses run wild. easily my favoutire car on the drift track. what a weapon! Mais moi je voudrai savoir ces performances ( 0 à 100 km/h et vitesse de pointe ) Svp !! It is the alloy of carbon names steel http://www.nikalsteels.ie/ that provide strength to the wheels. Human inventive nature brings some new technology that is why I love to ride these wheels.